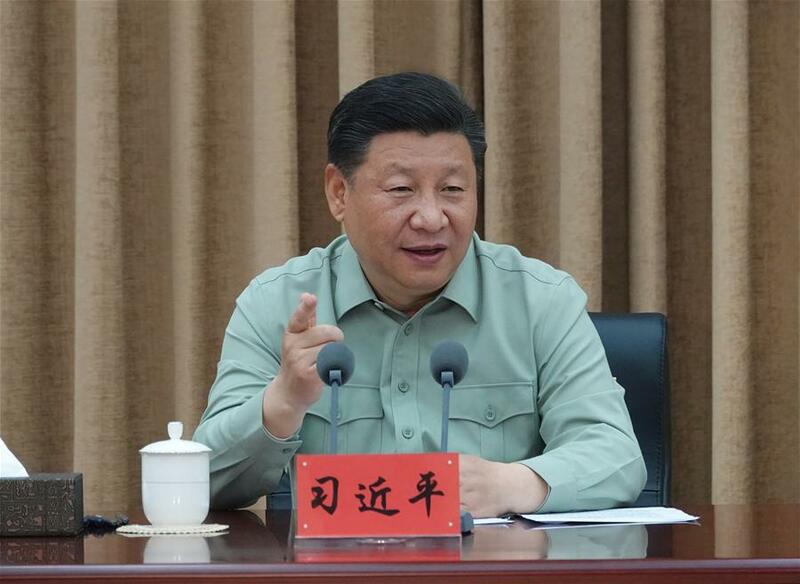 BEIJING, May 16 (Xinhua) -- President Xi Jinping Wednesday stressed accelerating the development of modern military science, and building high-level military research institutions to support the building of a strong military in the new era. Xi, also general secretary of the Communist Party of China (CPC) Central Committee and chairman of the Central Military Commission, made the remarks during an inspection of the People's Liberation Army Academy of Military Science. Noting that military science was an important force in guiding military practices and spearheading transformations, Xi said research should be combat-oriented, meet the needs of the armed forces and be forward-thinking. He also called for better integration of military theories and technologies, research and practices, as well as military and civilian uses. "We must continue to enhance the political loyalty of the armed forces, strengthen them through reform and technology, and run them in accordance with law," Xi said. Visiting the academy's medical research institute, Xi said he was impressed by their achievements. When calling on several leading military scientists at the academy, Xi encouraged them to make greater contribution to the building of a strong army. He instructed authorities to respect and take good care of experts and develop a team of high-level military researchers. After hearing a work report by the academy, Xi made an important speech, in which he said more importance should be attached to innovations, calling for innovations in military research, defense technology and the organization model of military research. "Researchers should work on an advanced theoretical framework for warfare, which fits the unique conditions of the Chinese armed forces and conforms to the rules of modern warfare, in a bid to bring the Marxist military theories in contemporary China to a new stage," he said. Xi called for accelerated implementation of the strategy of strengthening the armed forces through science and technology, consolidating and strengthening of the advantages in relevant fields, and greater innovation efforts in emerging fields. He said independent innovation was a strategic base point, calling for breakthroughs in core technologies as early as possible. Scientific and technological innovations should focus on the need of the war and help enhance the military's combat capability, Xi said. He also called for reforms to the policies and systems of military science and technology, an open mind and strengthened international exchanges and cooperation in military research. "The absolute leadership of the CPC over the armed forces should be unwaveringly upheld," Xi said, noting that "the CPC leadership should be observed throughout the whole process and all aspects of military research work."